There’s a mad scramble underway in the scientific community to learn everything possible about the imperiled West Antarctic ice sheet, whose glaciers hold back enough water to raise global sea levels by 10 feet or more. The latest troubling climate factor to keep an eye on? El Niño. 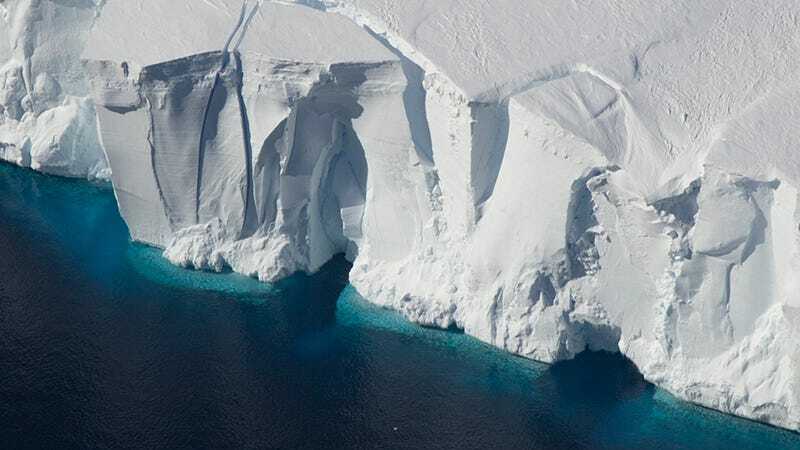 A team of researchers has learned that the powerful 1997-98 El Niño event dramatically accelerated the melting of the ice shelves buttressing glaciers in West Antarctica’s Amundsen sea sector. The findings offer additional insight into the dynamics of this highly studied stretch of ice. They also raise new questions about the future stability of West Antarctica’s massive coastal glaciers, which are currently shedding billions of tons of ice per year. Some climate models project more extreme El Niño events in the future, and one possibility the new work raises is that El Niño-driven thinning of ice shelves could push glaciers that were already weakened by climate change into a state of unstoppable collapse. Lead study author Fernando Paolo, who conducted the research at the Scripps Institution of Oceanography and is currently based at NASA’s Jet Propulsion Laboratory, unearthed the 1997-98 El Niño’s outsized impact in West Antarctica while he was mining satellite records to look for short-term factors that impact the growth and thinning of ice shelves. El Niño is a recurring climate pattern defined by above-average ocean temperatures in the equatorial Pacific that affect weather patterns around the world, leading to a slight uptick in global temperatures. To tease out its impact on the West Antarctic ice sheet, Paolo and his colleagues looked at 23 years of satellite data collected by four European Space Agency-led satellite altimeters, which measure the height of ice shelves. The record, spanning 1994 to 2017, encompassed four El Niño events, including the two strongest ones on record, the 1997-98 and 2015-2016 El Niños. After obtaining precise ice shelf height data, the researchers used a regional climate model to work out how much of the variability on a year-to-year basis was due to snowfall (which causes ice shelves to grow taller) versus ocean-driven melting (which causes ice shelves to thin from below). The findings, published Monday in Nature Geoscience, reveal that the 1997-98 El Niño led to a substantial loss of mass from the bottom of the ice shelves in West Antarctica’s Amundsen sea sector, even as the shelves appeared to grow about ten inches taller from additional snowfall. Overall, ice shelves in the Amundsen sea sector lost about five times as much mass as they gained during the event. According to Paolo, the changes can be explained by El Niño forcing a high pressure anomaly into the low-pressure system parked over the Amundsen sea, impacting wind patterns and driving more snowfall in West Antarctica. This change in the windfield also impacted ocean circulation, helping to pump warm, deep ocean currents to the surface, where they ate away at the ice from below. The powerful 2015-2016 El Niño didn’t cause a similar loss of ice, leading Paolo to suspect that multiple climate conditions need to be met to trigger a major melt. He’s now gathering additional satellite data to extend the record further back in time and try to better understand the effect of short-term climate oscillations on these ice shelves. Peter Neff, a glaciologist at the University of Washington who also wasn’t involved, said the new study was “impressive work” that “demonstrates what many have suspected for a while”—a connection between El Niño and the Amundsen sea coastline. That connection, between short term factors like El Niño and long term, large scale change in West Antarctica is especially important if we want to predict how this massive ice sheet will respond to human-driven warming. El Niño alone won’t trigger an ice apocalypse—but when you combine it with human carbon pollution, it might just be the fracture that sets off the avalanche. Update: This article has been updated to clarify that El Niño forces a high pressure anomaly into a persistent low pressure region over the Amundsen sea.